After two previous successes with ice cream (here and here) I wanted to try a slightly different dessert in my ice cream maker so I went on the hunt for a frozen custard recipe. They all seemed like a LOT of work so I took a chance and whipped up this ‘shortcut’ version. Now for those of you unfamiliar with the concept of frozen custard, it’s much like a rich, thick ice cream with a bit more of a complex flavour. It’s quite popular in the US (and with followers of Ottawa’s Merry Dairy!). Heat the milk and cream in a saucepan, stirring and adding the sugar slowly as it comes to a boil. Dissolve the custard powder in a little bit of extra milk and add to the boiling mixture while stirring. Boil for 1 minute (you should see it thicken) and remove from heat. Place the mixture in a container and chill in the fridge. Once well chilled, add it to the ice cream maker and follow the manufacturer’s instructions to freeze it. When finished, place it in the freezer to firm up. 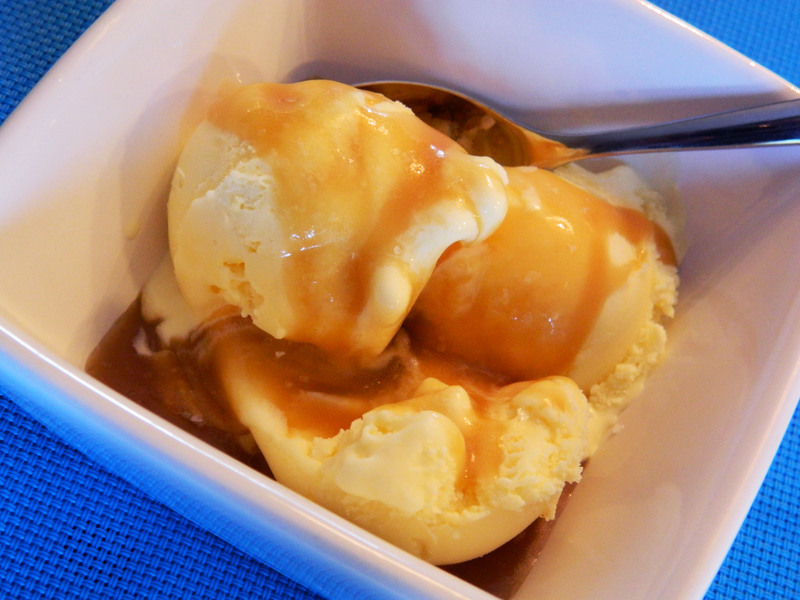 For the caramel sauce, I used this recipe adding 1 oz of 40 Creek Whisky. I then topped my sundae with a sprinkle of good flaked sea salt.